The Featherbed Railroad is one of the more extensive marketing campaigns I've ever been involved with. The Featherbed Railroad is a really unique lodging property comprised of nine vintage railroad cabooses nestled among centuries-old trees on the shore of Clear Lake, considered to be the oldest lake in these United States. For the Featherbed Railroad I've designed a unique website that adapts to both computers and smart phones; designed the logo, Facebook Fan Page, Twitter, LinkedIn, Google+, Google Maps and other accounts. I also do regular e-mail marketing campaigns for this resort where I write virtually all the content plus manage distribution. In September of 2012 we had a very successful exhibit at the Sonoma Home Show which coincides with the Redwood Empire Train show. 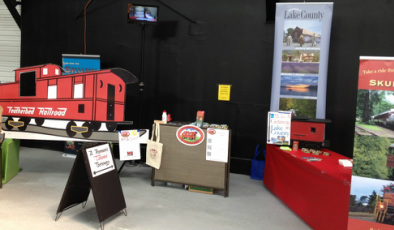 At our booth we held a Facebook contest to earn more "Likes" for the Featherbed Railroad's Facebook page. This was hugely successful. What's more we partnered with the Skunk Train and the County of Lake to make this all happen which added presence to our booth and also helped defray the cost. I created a video for the train show and while on the subject of video, I've done a number of videos for the Featherbed Railroad and others.